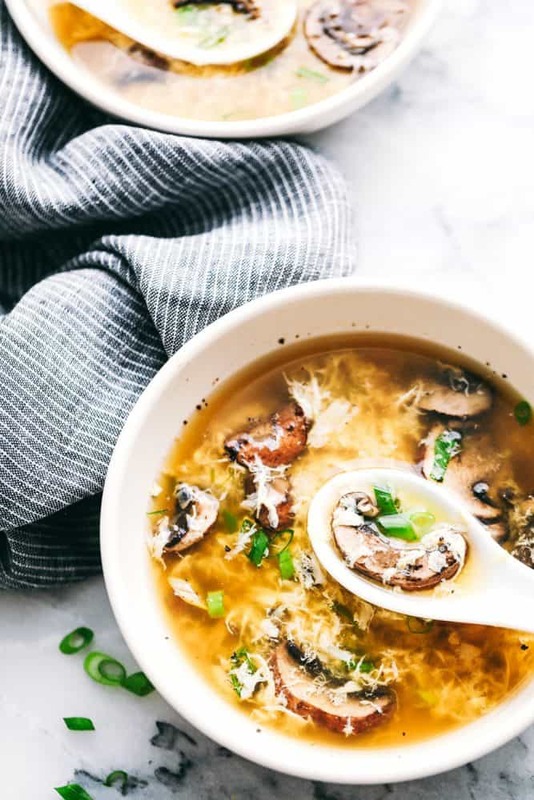 BEST Egg Drop Soup is a warm, thickened broth, with rich flavors of chicken and beautiful egg ribbons that add the perfect touch for this bowl of soup. Enjoy this savory, simple to make soup recipe in your home in just minutes. Bring the restaurant to you and enjoy with your family! This authentic Egg Drop Soup is known to be a favorite in every Asian restaurant. It warms you up and is comforting throughout your meal. It goes great served with out favorite better than takeout Easy Fried Rice, Sweet and Sour Chicken, or even this Slow Cooker Mongolian Beef. This soup is always a highlight for me when we go out to eat! I love the simplicity of it and all the flavors! Looking at it and seeing the ingredients for this soup, you would be surprised the powerful flavor it has and the feel good warmth it gives you. I love ordering this at the restaurant but tend to crave it at home. I knew I needed to make this for our family to enjoy! This recipe turned out so good and almost too perfect! haha. I shared this with my family for dinner and it was pleasing to all ages and genders. It is a quick and easy meal that can be a main dish, appetizer or a side dish with other Asian inspired meals. We had it as a main course for dinner on a busy week night and it worked out perfectly for our family. My kids loved it! It took minutes to make, filled them right up and we were able to sit down together and hustle off to our next activity. 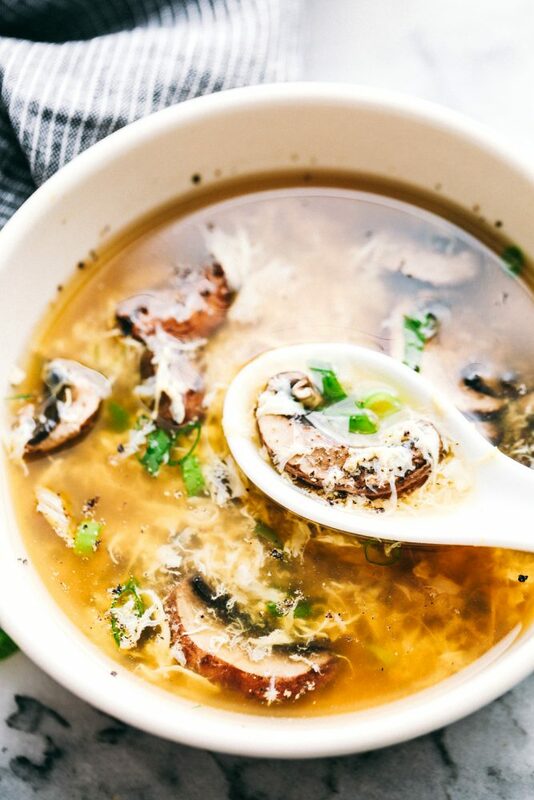 Your family will love the taste and savory flavor this Egg Drop Soup has to offer! How Do You Make Egg Drop Soup? 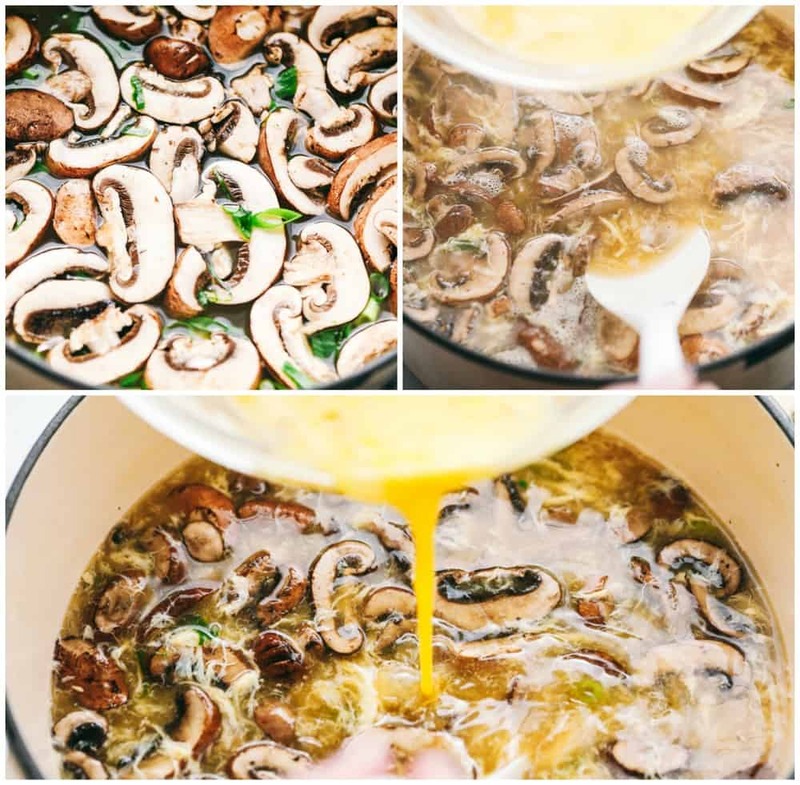 In a large pot add 3 1/2 cups chicken broth, soy sauce, green onions, and mushrooms and bring to a boil. In a small bowl add the cornstarch and 1/2 cup reserved cornstarch and whisk until combined. Pour into the soup. Reduce heat to a simmer. Slowly stir in the beaten eggs as you are stirring the soup. The eggs will start spreading out like ribbons in the soup. Garnish with additional chopped green onions if desired. How long does Egg Drop Soup last? Egg Drop Soup will last about 3 to 4 days in the refrigerator. It warms up nicely on the stove top for about 8 to 10 minutes, stirring occasionally. If you are needing to freeze this soup, you will want to only freeze the broth. The eggs will become rubbery when reheating. It is best to reheat the broth and add the eggs once it is heated up. Is Egg Drop Soup Keto Friendly? Yes!! It has 17 grams of fat, 23 grams of protein and only four grams of net carbs per serving. This is simple to make and perfect for your Keto diet! What makes Egg Drop Soup Thick? The chicken stock mixed with corn starch thickens this soup right up. If it is runny you can add in more corn starch, flour or other thickner that you prefer. 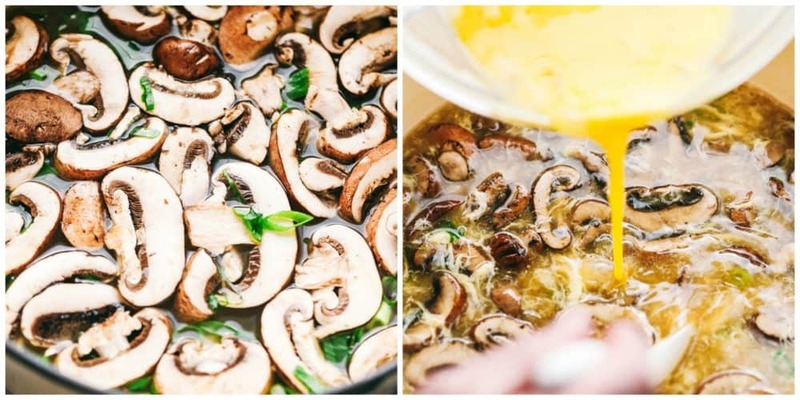 Egg Drop Soup should be a clear, creamy color and a thick texture with white looking ribbon that floats in the soup. 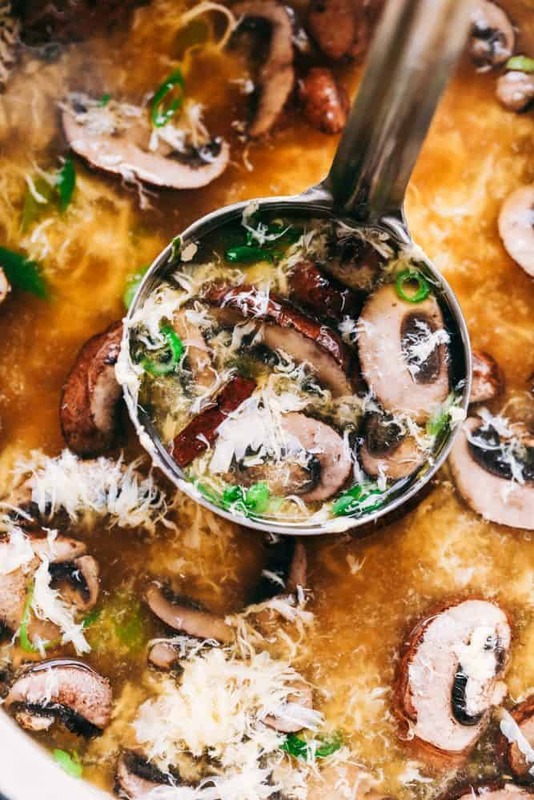 What can you serve with Egg Drop Soup? Want more Asian Inspired Meals? Check these out! I would like to try this, but we are not fond of mushrooms. Is there a substitute you recommend, or should I just leave them out? Thank you. I made this for dinner tonight and just omitted the mushrooms. It was fabulous, and so easy! Thanks very much. Omit or use whatever you normally substitute or mushrooms. Do you mean reserve 1/2 cup of reserved broth? It says 1/2 c of reserved cornstarch. Add the cornstarch to half a cup of the broth to stir and combine together. Then add back to the soup. Unfortunately, it’s not keto friendly with the cornstarch. Omit that and it’s perfection!